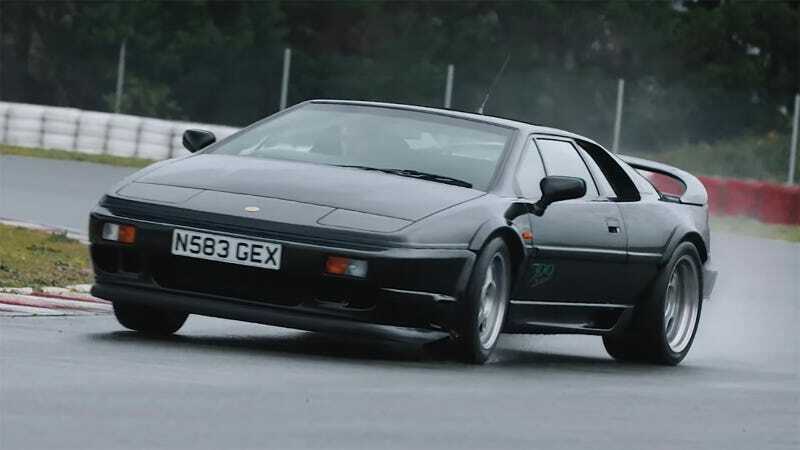 The Lotus Esprit is a quintessentially 1990s small-batch supercar. Its intensely pointy body is punctuated by square taillights. The cockpit is about as artfully executed as a Power Wheels car. But 25 years later, the limited-run Sport 300 is still special. In all seriousness, the final exterior design of the Lotus Esprit is one of my favorite things to ever hit the road in Europe or any other continent. The pop-up headlights and parts-bin door handles slay any chance this car might’ve had of becoming “timeless,” but I still think it’s beautiful and appropriately intense looking for what it’s supposed to be: a true driver’s car. Now the Sport 300 was not just another Esprit. Even though there is really no such thing as “just another Esprit.” I think I see one or two a year, even in Los Angeles where supercars are as common as Camrys. But you get my point: this particular variant is exceptionally rare. Only 64 Esprit Sport 300s were made, according to Catchpole. Though a 1993 AutoCar article promised 50 would be built when the car first came out. That article also explains that the Sport 300 is not really “a modified S4” version of the Esprit, as it appears to be. “In essence, the Sport 300 is a derivative of the Esprit X180R racer that has competed successfully in the American SCCA and IMSA supercar series for the past three years,” AutoCar wrote, about 25 years ago. Today, Catchpole notes that the driver’s seat feels “about a foot closer to the ground” than it does in a modern Lotus Evora, which, wow. In any era the car was a marvel of volumetric efficiency–its plucky 2.2-liter turbocharged four-cylinder engine turned out a claimed 302 brake horsepower and 287 lb-ft of torque. Considering the fact that the car was only supposed to weigh 2,738 pounds it should have been a screamer, those performance specs are pretty modest by modern standards–AutoCar called the 0 to 60 time at 4.7 seconds, with a quarter-mile of 13.4. Catchpole notes that the “unexpected joy of the Sport 300 is just how tough it feels,” though. And the real pleasure of pushing a Lotus around comes from taking turns, not slamming straight ahead off a stoplight. To that end, the Sport 300 is much wider and stiffer than a regular Esprit, which you can see Catchpole taking advantage of getting just slightly sideways in his video. The Esprit Sport 300 listed at £64,995 when it was new. That’s about $83,695 at the current exchange rate, translating to a little over $145,000 in today’s money. If this car hit the market as-it is right now, I’m sure we’d all complain about the interior that looks like it was lifted from a Playskool product and adult-sized. But it sounds like the car is still a handful, which of course is what we love most about fast cars from this era.